Last week I sat down with Sequoia Capital partner Roelof Botha to prepare for tomorrow’s Super Angels To Super VCs — The Changing Face Of Venture Capital panel at TechCrunch Disrupt. As part of that conversation I asked about some of the big exits that Sequoia-backed startups have enjoyed over the last couple of years. After naming a few I became more curious and asked for more data. 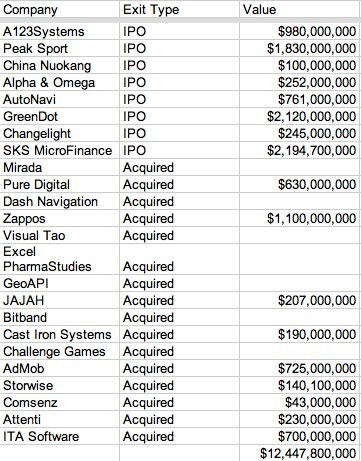 Of course this isn’t the total amount of money Sequoia made from these deals since they only owned a percentage of each one. And when I told Sequoia I wanted to write about this they quite rightly pointed out that it’s the entrepreneurs, not Sequoia, that should get the credit. But at least some credit goes to Sequoia for at least picking the right entrepreneurs and helping them along the way. 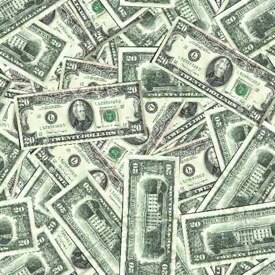 What Sequoia and other venture capital investors are doing to create huge value is clear. We’ll discuss this more on stage tomorrow. Note: Some of these companies are based in Asia and I had to do some heavy estimating on their market caps, but I went with the lower estimates in each case. If you note any errors please point them out.